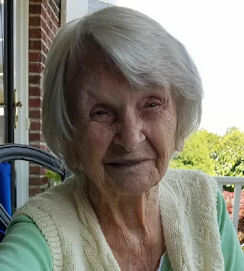 Elizabeth Gregorek (nee Budhusaim), 94, of Lorain, died Friday January 25, 2019 at the home of her daughter Barb in Amherst. She was born May 6, 1924 in Poland and had resided in Lorain since 1961 moving from Lancaster, New York. Elizabeth was sent to work in a Siberian labor camp by the Russians from 1940-1942. She served with the Polish Air Force as a Corporal under English command during World War II. Elizabeth enjoyed spending time with her grandchildren, her black Labrador Kasha, gardening, and cooking. She was a member of St. Frances Xavier Cabrini Catholic Church in Lorain. She is survived by her daughters: Teresa (Ronald) Kurdziel of Canadian Lakes, Michigan, Mary (Andrew) Lander of Ashland, Helen (James) Damasiewicz of Avon and Barbara (Sam) Rosey of Amherst; sons: Edward (Carolyn) Gregorek of Lorain and Richard Gregorek of Arizona; grandchildren: Gregory Kurdziel, Monica (Brad) Van Dike, Tracey (Ryan) Chisholm, Chastity Gregorek, Edward Gregorek, Joshua Gregorek, Dennis Lander, Jennifer (Aneet) Deshpande, Melissa (Bill) Cyders, Jacob Damasiewicz, Alec Damasiewicz and Samantha Rosey; 12 great grandchildren and brother Paul Budhusaim of Ilminster, England. She was preceded in death by her husband Zygmunt Gregorek on May 12, 1994, infant son John Gregorek, parents John & Maria Budhusaim (nee Rocewicz) and sister Anastasia Bratun. Elizabeth’s family would like to thank her caregivers, Rebecca and April, for all the comfort and care that they provided Elizabeth during her illness.